We spent this past weekend in Blue Hill, Nebraska for Trinity Lutheran’s 125th anniversary. My grandfather, Martin Hofman, was pastor there for 14 years in the 50’s/60’s. It was very fun, because lots of my family was there! My mom and dad, Aunt Ruth and Uncle David, Aunt Becky and Uncle Norm, and of course – Mark and Rachel! 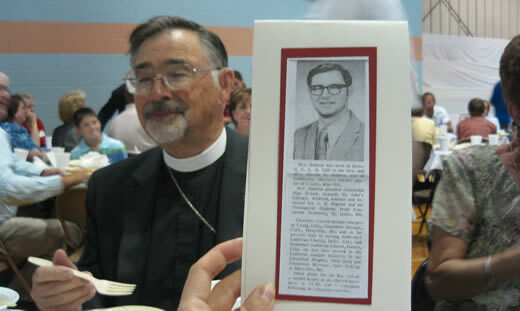 Dad was ordained there in 1961, so he was invited to preach at their afternoon celebration service. 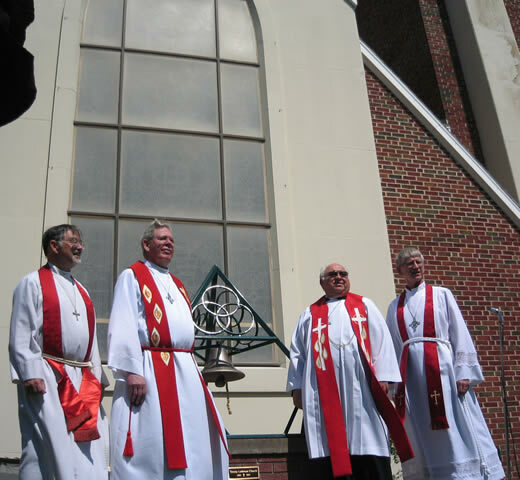 After the celebration service they had a dedication for the original church bell.Â If any of you remember Joel Witt from college, that’s his dad on the far right.Â He’s the pastor at Blue Hill now. Haha.. “The Four Horsemen of the Apocrypha” I was lauging out loud! Thank you, thank you. That one was a cooperative effort from Lloyd, Rachel, Mark and myself. We’re a dynamite comedy team!